Stanislavski Theatre (or to use its full, rather formal name ‘Moscow Musical Theatre named after Stanislavski and Nemirovich-Danchenko) is truly a hidden treasure…and yet performs some of the worlds most renowned ballets like Giselle, La Sylphide, Cinderella, Swan Lake, Don Quixote, Nutcracker and so on. Russian ballet aficionados rate the Stanislavski cast as good as the Bolshoi and Kremlin Theatres…Russian ballet is the best in the world. Stanislavski company’s Operatic repertoire include Betrothal in a Monastery, a burlesque double-bill Cafe «Socrates» featuring Erik Satie’s Socrates and Darius Milhaud’s Le pauvre matelot, Bizet’s Carmen, Così fan tutte, The Demon, Die Fledermaus, Eugene Onegin Vladimir Kobekin’s comic opera Hamlet (Prince of Denmark)(Russian) Comedy (2008), Il Barbiere di Siviglia, La Bohème, La forza del destino, La traviata, Les Contes d’Hoffmann, Lucia di Lammermoor, Madama Butterfly, May Night, Moscow, Cheryomushki, Pelléas et Mélisande, Pique Dame, The Tale of Tsar Saltan, Tosca and Werther. The theatre combines classical Russian ballet with innovation and new forms. Recently renovated and in the heart of Moscow, on Bolshaya Dmitrovka street, its beautiful old-fashioned auditorium seats 1,500, and is sold out every night. The two men, whose names the theatre bears, were great Russian theatre figures and have gone down in its history as reformers of dramatic theatre. opera and ballet. Stanislavsky’s and Nemirovich-Danchenko’s productions were seen as amongst the very best in the art, marked as they were by harmony of all expressive means. This original ballet company has always remained faithful to the principles of its founders. The State Kremlin Palace is the main stage in the Russian Federation and is worthy of historical note, as the home for the Communist Party of the Soviet Union; the founding and ruling political party of the Union of Soviet Socialist Republics. The Palace is situated within the medieval Kremlin fortress and Official Residence of the head of the state the Russian Federation. Whilst celebrating its 50th anniversary in 2011, it is the youngest building within the Moscow Kremlin. It has been witness to significant events in contemporary history, not least where Boris Yeltsin, the first President of Russia took his oath and during the Soviet era the first Congresses of People’s Deputies were held here. The Palace construction became one of the main symbols of the Soviet era. Built with three foyers, each a work of art in its own right, each gives access to the main auditorium: the mirror, parquet and of coats of arms foyers lead into the 6000 seat auditorium of the State Kremlin Palace. Visitors are ensconced in comfortable armchairs, benefiting from first class acoustics and state of the art lighting equipment. Spectators enjoy every minute of the performance. 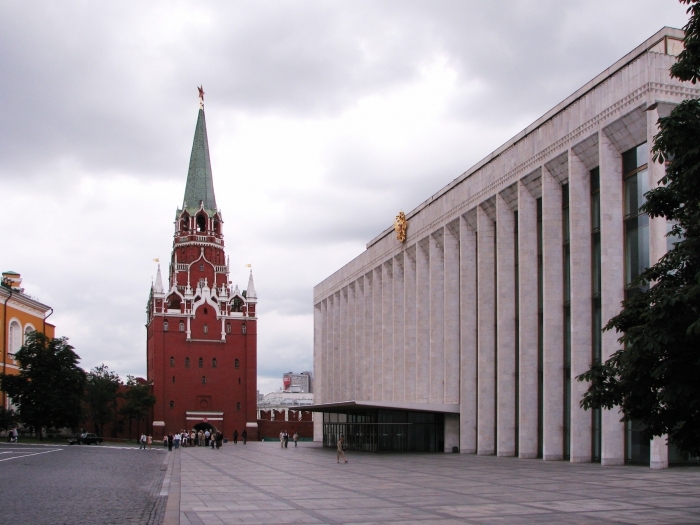 The stage and set of the State Kremlin Palace is one of the largest in Eurasia. It can simultaneously house one thousand actors. Its scale is not its only advantage. It is possible to embody any imagination of the directors as the stage consists of 16 elevating platforms; 4 hatches for the appearance or disappearance of actors; in the middle of the stage is a 17m diameter rotating circle intended for a fast change of scenery. 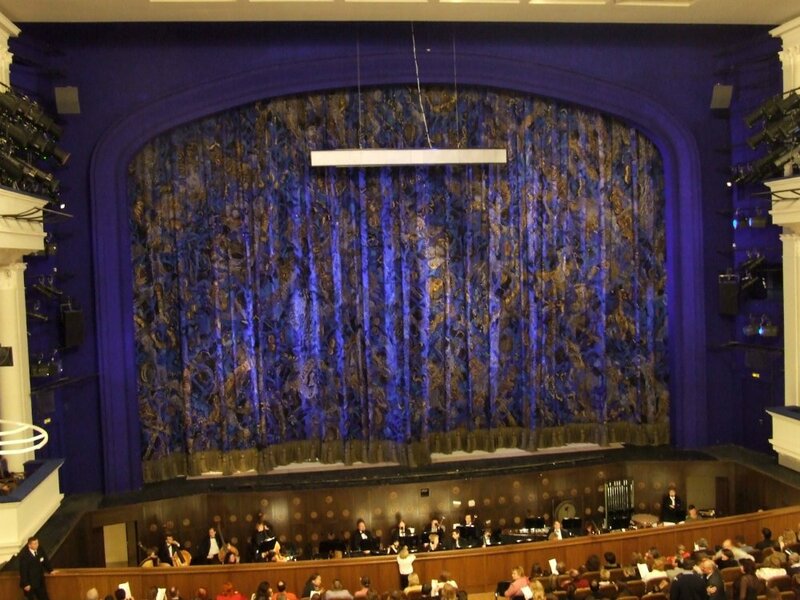 These features make the Concert Hall of the Kremlin Palace one of the best in the world. The Kremlin Palace is home to the Kremlin Ballet, one of Russia’s finest Ballets. The troupe was created on the initiative of the director of the Palace of Congresses, at that time, Pavel Nilov. The world renowned ballet meister and “National Artist of the Russian Federation” Andrey Petrov has been artistic director during all these years. Given its home at the very centre of power of the Russian Federation, the emergence of a choreographic collective of classical direction on this stage was predetermined from the very beginning. The scale of the stage productions reflect the status of the Palace, carrying out socially important actions and classical musical productions. In addition to the home troupe, some of the best opera theatres of the world, among them the Opera of Rome, the Bolshoi Theatre, the Mariinsky Theatre tour here. Alas, as with most the ‘best’ productions tickets are sold out months in advance. However, we are able to provide some tickets for the lucky few who wish to visit what is declared as ‘Russia’s finest stage’.